Grapefruit sugar scrub is a homemade skin care recipe, made with real food ingredients; grapefruit juice, honey, sugar, and grapeseed oil. You probably wouldn’t want to eat it, but the ingredients are edible, non-toxic, and safe! This sugar scrub recipe came in my swag bag, along with lots of other cool goodies, from the BlogHer Food convention in Miami a couple weeks ago. I love to exfoliate my skin in the summer months to keep a healthy, radiant glow. It’s also a great way to prep your skin for sunless tanning lotions. You don’t want to end up with embarrassing streaks…uh…been there, done that. The grapeseed oil makes this scrub a pretty green color and moisturizes for soft, smooth skin. You can also soak your hands in this mixture for brighter nails. 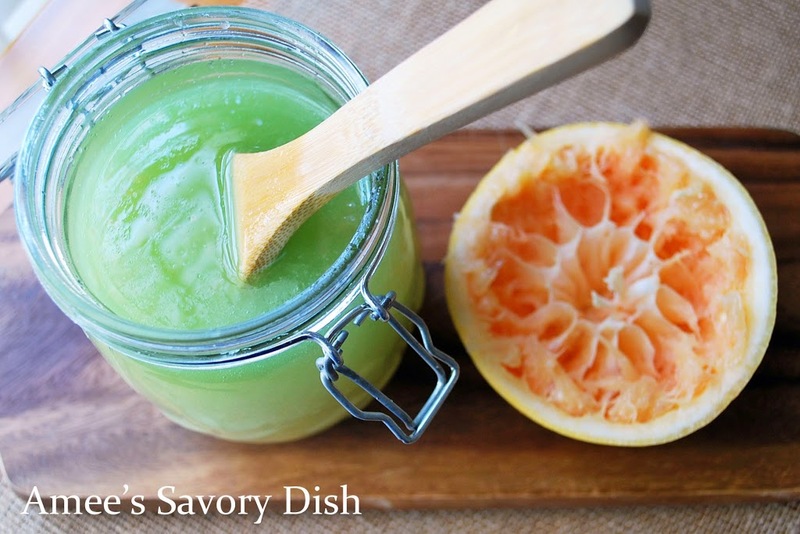 Trust me, this grapefruit sugar scrub recipe is one you’ll want to make often. Apply to your hands by dipping a sliced grapefruit in the sugar mixture and massage into skin and around nails. Follow treatment with a warm soaked wash cloth. Now, these grapefruit recipes are completely edible, and delicious! I followed your recipe to the tea and mine didn’t turn out green – any guesses on why? Hi Julia! Yes, you probably used a more refined grapeseed oil. I used an organic grapeseed oil that had a beautiful, bright green color. A good quality grapeseed oil will have a high chlorophyll content and a nuttier flavor. Hi Amee – I have one more question. How long do you think this will keep? I put mine in the fridge hoping to get a week out of it. You don’t actually need to refrigerate it, just make sure that it’s stored in an airtight container. If water gets into the mixture, then mold can grow. It should keep for several weeks, even a couple of months stored properly. Just do the good old smell test if you think it may be rancid. Thank you! I love the scrub – works really well. My 9 year old daughter and I had fun making it together.